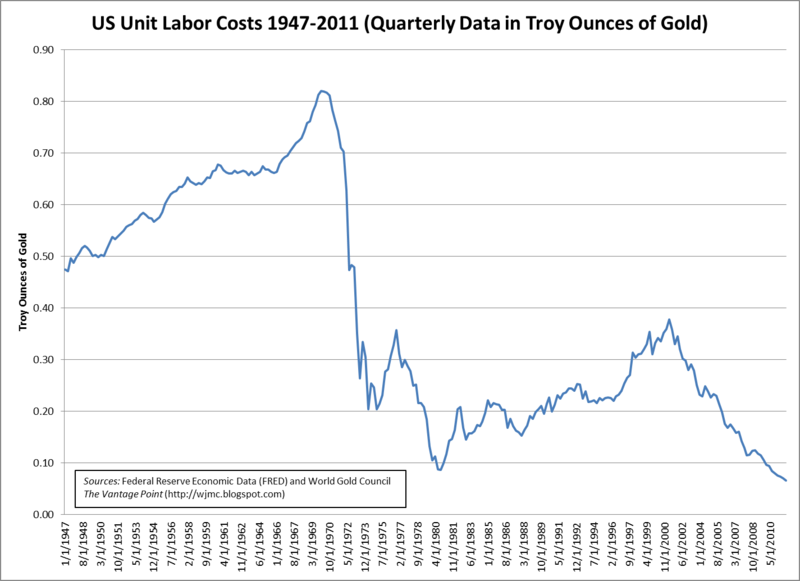 According to data published by the World Gold Council and Federal Reserve Economic Data (NASDAQ:FRED), US unit labor costs have declined from a peak of over eight-tenths of an ounce of gold (0.82 troy ounces) in 1970, to less than a tenth of an ounce of gold (0.07 troy ounces) in 2011. 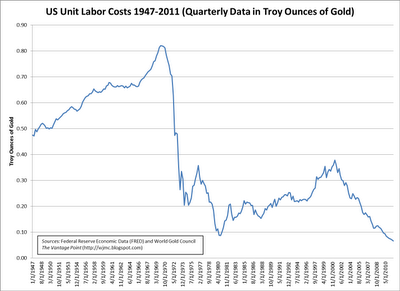 Thus, unit labor costs have declined by over 91% in the US since 1970 (using troy ounces of gold as the measurement standard). Unit labor costs can be computed by dividing employer labor costs (payments made directly to workers plus employer payments into funds for the benefit of workers) by real value added output. Unit labor costs can also be computed by dividing hourly labor costs by output per hour.